When you live in a somewhat small community like Cache Valley Utah, you have to find ways to make your wedding photos interesting and unique. The best way to make them amazing, is to make them yours. Incorporating your likes, interests and hobbies gives you an extra emotional investment in the photos. Talk with your wedding photographer about your ideas. They will appreciate your input. Just keep in mind to keep it within bounds you can fulfill. Don't ask them to do an airplane photo if you don't have access to an airplane. We absolutely loved working with Casey and Lynsey. 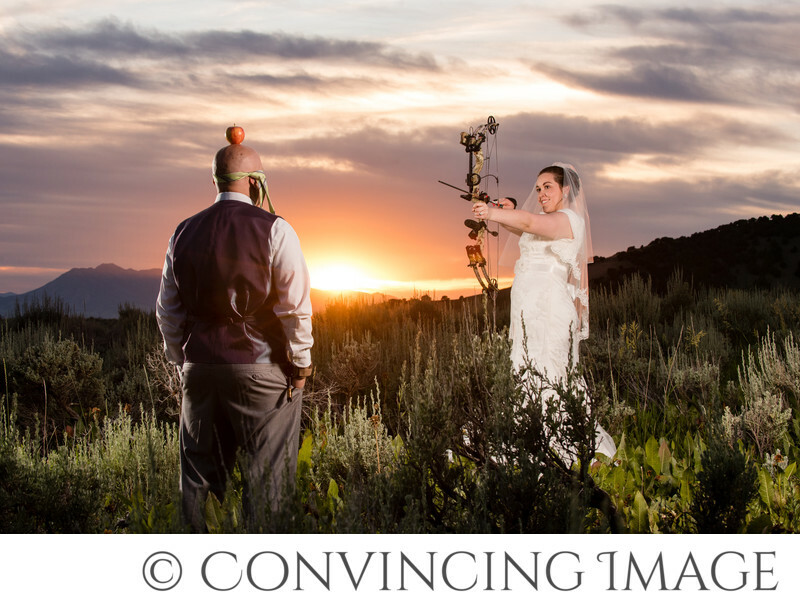 When they approached us with the idea of using bows and arrows in their formal session, we jumped at the chance to add something unique to our portfolio. The thing that made it so sweet was that archery got Casey & Lynsey their start together. Lynsey asked Casey if she could go target shooting with him. He tells that he was a little oblivious to the fact that she wanted to go on a date with him. Their first date certainly went well, as you can tell by the fact that a few months later, they were taking formal pictures with their bows and arrows. It also helps make your sessions go better when you're having a great time. These two spent the whole evening laughing with us and enjoying each other. Relax, have fun and incorportate yourself and your wedding photos will be beautiful and have extra meaning to you.